Rediff.com » News » How can we be a regional power with this defence budget! How can we be a regional power with this defence budget! 'The government of the day has lost sight of the fact that defence of the country is as important as its growth,' says Brigadier S K Chatterji (retd). 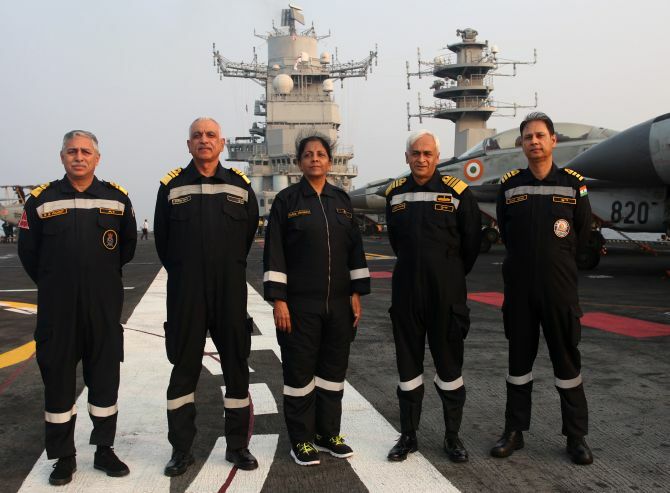 IMAGE: Defence Minister Nirmala Sitharaman with Admiral Sunil Lanba to her left, Flag Officer Commanding-in-Chief Western Naval Command Vice Admiral Girish Luthra to her right, Flag Officer Commanding-in-Chief Western Fleet Rear Admiral R B Pandit left, Captain Ajay Kochhar, commanding officer, the INS Vikramaditya, right, on board the INS Vikramaditya. The Defence Budget 2018 has an outlay of Rs 2.95 lakh crore, an increase of 7.81% as compared to the last fiscal. A nation facing a collusive threat of two nuclear neighbours, a proxy war and multiple insurgencies has opted to continue with its aging military inventory. All that it has available as its capital outlay for 2018 is Rs 99,947 crore (Rs 999.47 billion). Let us please shed our aspirations of being a regional power. We cannot be sure of anything beyond defensive capabilities with such an allotment. The current status of military capabilities is as such suspect. The Indian Air Force's authorised 42 squadrons are already down to 33 squadrons. The squadron strength is going to decline further. To balance this enormous challenge we have so far contracted only 36 Rafales and placed orders for 123 Tejas fighters manufactured by Hindustan Aeronautics Limited. HAL's annual capacity will allow it to deliver the entire order only by 2024-2025. The state of helicopters is appalling. Most of these are outdated Cheetah and Cheetak, which are too often called flying coffins. We have a requirement of over 1,200 helicopters in the next 10 years. A deeper look into the defence budget throws up a few more interesting facets. The allotment under the Capital head of Rs 99,947 crore is less than the allotment for defence pensions. Out of the total capital allocation the army, navy and air force get Rs 26,668 crore, Rs 20,848 crore, and Rs 31,755 crore, respectively. The DRDO gets Rs 9,734 crore. However, the Capital outlay caters for both accumulated commitments that cover tenders issued out already and fresh acquisitions that may be inked during the budgeted period. Normally, about 80 percent of the capital outlay is consumed by accumulated commitments. It boils down to only 3.6 percent of the entire defence budget being available for modernisation purchases during 2018-2019. Of course it needs to be also elaborated that fresh acquisition deals entered into will involve payment of up to 15 to 20 per cent only in the current fiscal. For our armed forces, even the need to replace the aging INSAS rifle that a soldier carries as his personal weapon, has been pending for over a decade. The CISF deployed at our airports has better weapons already. Our aging artillery and air defence guns and missiles, aircraft, dated communication equipment, aircraft carriers, submarines; the list is endless and require immediate investment. Under the circumstances, the military is headed towards a low technology trap from which it will be difficult to emerge. Let us take the example of anti-tank missiles which has been in the news to understand the kind of trap we are already boxed into. We have a requirement of 8,500 missiles and approximately 650 missile launchers. After a marathon selection process it appeared that the Israeli Rafael's Spike anti-tank missile was going to be awarded the contract. All of a sudden, the deal turned cold. The Israeli prime minister's visit reopened a window of opportunity. However, even if the order is placed today, military equipment is not available in large enough numbers to fulfil our requirements overnight. Rafael would take five to six years, if not more, to fulfil the whole order. By then the technology will be outdated. A new generation of anti-tank missiles will be in use and we will be left with obsolete equipment. Obviously, force modernisation needs to be carried out in time, or lose out on the very objectives of modernisation. Technology jumps will only be more and more rapid as the days go by. At 1.58 percent of the GDP, the defence budget is one of the lowest since the Chinese aggression of 1962. When compared with the global average of 2.2 percent, and that of countries that face high threat levels like Israel with 5.7 percent of GDP being earmarked for defence, we are definitely way off the mark. Finance Minister Arun Jaitley has also referred to the fact of border roads infrastructure being upgraded and new roads being built. He also informs us about a new tunnel under the critical Sela Pass, a bottleneck along the Tejpur-Tenga-Sela-Tawang-Bumla axis with Bumla being located along the India-Tibet Line of Actual Control. Such upgrades will strengthen our defence capabilities undoubtedly. However, they are insufficient for us to face the Chinese with its defence budget at two percent of GDP. Further, the Chinese economy is three-and-a-half times our economy. In real terms, their two percent would be whoopingly larger than ours. The Budget also informs us about two defence production corridors being created. They will definitely help in indigenisation of defence equipment, a crying priority for us. We are the biggest importer of defence equipment because of keeping it primarily as a government domain with the private sector dissuaded by policies enacted. A new defence production Policy 2018 has also been promised. The government of the day has lost sight of the fact that defence of the country is as important as its growth. The previous dispensation at Delhi had not too dissimilar an approach either. The forces and the strategic community will hope that the next Budget will be based on threat assessment and military profile required to counter the threats. It will be in consonance with our geo-political aspirations. The bottom-line requirement is being able to inspire confidence among ASEAN and SAARC countries. A realisation that the strength of our defence forces is an essential pre-requisite for growth, stability and even FDIs coming in, needs to be perceived by New Delhi. As of now, the dye has been cast, and the forces must ensure that every penny spent is wisely done. Is defence hike enough to counter Pak-China threat? How much does India really spend on defence?